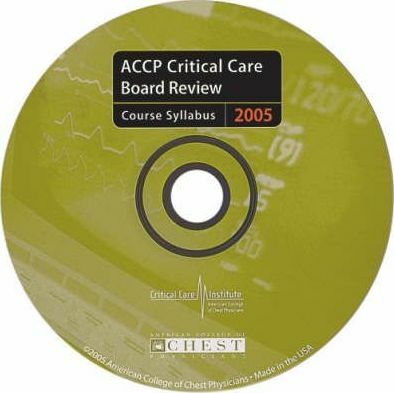 Drawing from the annual ACCP Critical Care Board Review Course, this syllabus covers almost every topic in a concise format. The CD-ROM contains the entire contents of the book, and you can search and navigate for the precise information you need. It is useful for preparing for the Critical Care Medicine subspecialty board examination. Bradycardia: Diagnosis and Management: Lewkowiez, L.; Tachyarrhythmias: Diagnosis and Management: Lewkowiez, L.; Hemodynamic Monitoring: Hall, J.B.; Shock: Kress, J.P.; Transplantation: Benditt, J.O. ; Myocardial Infarction: Hollenberg, S.M. ; Heart Failure and Cardiac Pulmonary Edema: Hollenberg, S.M. ; Acute Respiratory Distress Syndrome: Hall, J.B.; Endocrine Emergencies: Kruse, J.A. ; Infections in AIDS Patients and Other Immuno-compromised Hosts: Karam, G.H. ; Nervous System Infections and Catheter Infections: Karam, G.H. ; Trauma and Thermal Injury: Dries, D.J. ; Obesity, Obesity Surgery, and Critical Care Therapy: Alverdy, J.; Nutritional Support in the Critically III Patient: Susla, G.M. ; Acute Renal Failure in the Critically III: Muther, R.S. ; Poisonings and Overdoses: Zimmerman, J.; Electrolyte Disorders: Derangements of Serum Sodium, Calcium, Magnesium, and Potassium: Muther, R.S. ; Severe Airflow Obstruction: Schmidt, G.A. ; Hypothermia, Hyperthermia, and Rhabdomyolysis: Zimmerman, J.L. ; Thromboembolic Disease: Dellinger, R.P. ; Use of Blood and Blood Products in Critical Care: Luce, J.A. ; Upper Gastrointestinal Bleeding, Lower Gastrointestinal Bleeding, and Hepatic Failure: Everson, G.T. ; Mechanical Ventilation: Schmidt, G.A. ; Hypertensive Emergencies and Urgencies: Dellinger, R.P. ; The Bleeding Patient in the ICU: Luce, J.A. ; Coma and Delirium: Bleck, T.P. ; Weaning from Mechanical Ventilation: Stoller, J.K.; Issues in Sedation, Paralytic Agents, and Airway Management: Gropper, M.A. ; Acid-Base Disorders: Schmidt, G.A. ; Issues in Postoperative Management: Postoperative Pain Management and Intensive Glycemic Control: Gropper, M.A. ; Perioperative Evaluation and Management of Pulmonary Disease: Wiener-Kronish, J.P.; Perioperative Evaluation and Management of Cardiovascular Disease: Wiener-Kronish, J.P.; Severe Pneumonia: Niederman, M.S. ; Obstetric Issues in Critical Care: Strek, M.E. ; Acute Abdomen/Pancreatitis/Biliary Infection: Jeyarajah, D.R. ; Antibiotic Therapy in Critical Illness: Niedermann, M.S. ; Head and Spinal Cord Trauma: Bleck, T.P. ; Seizures, Stroke, and Other Neurologic Emergencies: Bleck, T.P.